It may be hard to imagine that your financial security will come down to dumb luck. But thats the approach homeowners make when they choose to do nothing about their septic system. The regular practice of prolonging time between pump outs and the refusal to support your septic system with septic additives is common among homeowners with septic systems. The problem is that eventually your luck runs out. Many homeowners will confuse the idea of septic tank problems vs. septic system problems. 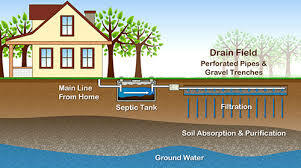 In fact, over 90% of the problems that septic systems have is in the drain field. The drain area can no longer keep up with the water and waste consumption in the home and the drain field floods. You may have a wet soggy yard, or maybe the system backs up into your home. This is all as a result of drain field failure, not septic tank problems. While the failure of the system may be in the drain field, the PROBLEM began in the septic tank. In order to understand it better, you need to understand how the science behind septic systems work. ‘Septic’ systems rely upon the presence of naturally occurring bacteria in the septic tank. This is why it is called a septic tank in the first place. The bacteria digests and liquefies the organic waste and paper in the septic tank. The remaining liquid is then sent to the drain field to be absorbed by the soil. If bacteria levels are reduced, or if the amount of waste in the tank becomes too much for the bacteria present in the tank, particles of waste make their way to the drain field. Over time, this leads to drain field failure. While the structure of the septic tank may not fail, the contents within the tank can be negatively affected and bring the whole system down. The first step is to admit that their is the potential for a problem on any given day. Whether your system is new, old, working well or struggling there is a chance of your septic system starting to fail every day. The regular use of anti bacterial soaps and detergents in most households is enough of a problem to reduce bacteria levels within your septic tank. If you use hair products, body washes and scented soaps, this problem can be magnified by their waxy consistency. Lastly, harsh cleaners like bleach and other germ killing solutions may be necessary to keep bathrooms and kitchens clean, but what about the negative affect they have on your septic system. Chances are that you use some, if not all of these items. So ask yourself, what am I doing to offset that damage within my system. Do you pump your tank as often as my county regulates it? Do you regularly add septic bacteria additives to keep bacteria levels healthy and effective? Or do you just close your eyes and hope that everything is OK? Remember, even if you have ignored your system in the past, there is still time to restore and prolong the life of your septic system. Replacing a septic system can cost anywhere from $4,000 – $20,000. This is nothing to sneeze at. Stick to your pump out schedules and make sure you use a high quality monthly septic maintenance treatment to prevent problems. If your system is already giving you trouble, there are septic shock treatments available online that can restore failing drain fields, but do your research carefully and get one that has a track record for success.